Sesame seeds are toasted along with red chiles and ground into powder with fresh coconut. The ground sesame mixture is mixed with steamed rice and finished with talimpu. 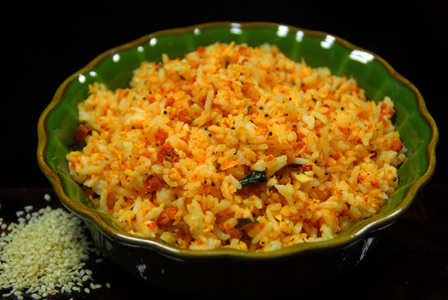 Serve sesame coconut rice immediately with any raita of your choice. Makes: 2 Cups of Sesame Coconut Rice. Heat a pan on low heat, add sesame seeds and toast them until light golden brown in color. Add the broken red chiles and roast for couple of seconds. Grind sesame seeds, red chiles and salt into fine powder using a grinder. Add the grated coconut and grind again into powder. If using leftover rice, make sure to warm up the rice before using. In a mixing bowl, fluff the steamed white rice with a fork. Stir in ground sesame coconut powder and sufficient salt. When mustard seeds start spluttering, add the sesame rice and remove from heat. 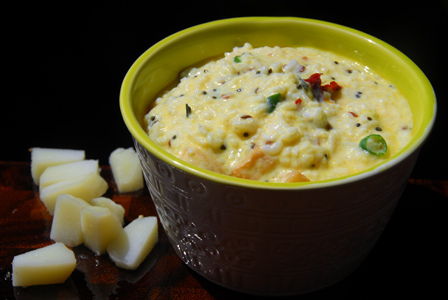 Stir well and serve sesame coconut rice with any raita of your choice. Notes: Make sure not to over roast any of the ingredients. Suggestions: Adjust spice with red chiles or add sliced green chiles along with talimpu for extra spice. Other Names: Sesame Coconut Rice, Nuvvulu Kobbari Annam. Fresh spinach leaves and fenugreek leaves are cooked in oil along with few whole spices and mixed with cooked basmati rice. Serve spinach fenugreek leaves rice with any raita of your choice. Makes: around 2 Servings of Spinach Fenugreek Leaves Rice. Wash and chop the spinach leaves. Remove stalks and thoroughly wash fenugreek leaves. Peel and grate the ginger and garlic cloves. 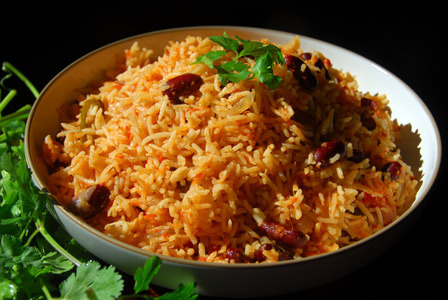 Soak basmati rice in 2 1/2 cups of water for half hour. 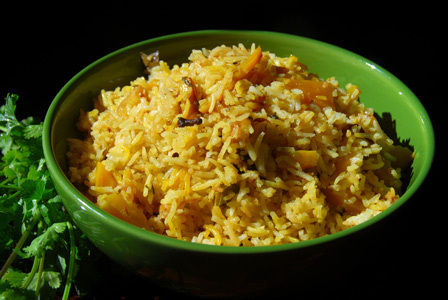 Cook the basmati rice with few pinches of salt till its almost cooked. Heat oil in a pan on medium flame, add all masala ingredients in order. When cumin seeds change color, add sliced onion. Fry briefly, stir in ginger garlic and green chiles. Fry for at least half a minute, add the spinach leaves and fenugreek leaves. Fry both the leaves for around 8 minutes or until the leaves wilt completely and well cooked and stir in sufficient salt. Stir in above spinach fenugreek leaves mixture with basmati rice and cook covered for few more minutes. Uncover and adjust any seasonings if necessary. 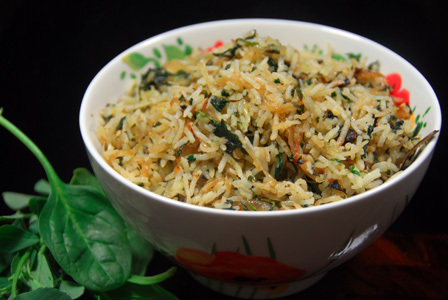 Fluff the rice with a fork if necessary and serve spinach fenugreek leaves rice with any raita of your choice. Notes: Make sure spinach and fenugreek leaves are fried well. Suggestions: Adjust spice with green chiles. Remove the standing spices before serving or before eating. Variations: Check other rice varieties here. Other Names: Spinach Fenugreek Leaves Rice, Palak Methi Rice, Palakura Menthikura Annam.